Central and Eastern European Wildlife, Gerard Gorman, Bradt Travel Guide, 2008. Available on Amazon.com as paperback & recommended by Janet Cornelow. Extraordinary Origins of Everyday Things by Charles Panati, Harper Collins, 2013. Available in paperback and Kindle editions. Homes of Family Names in Great Britain by Henry Brougham Guppy, London, Harrison and Sons, 1890. Free e-book available from Google Books. How to Write and Sell Historical Fiction by Persia Woolley, Writers Digest Books, 1997. An excellent guide, now apparently out of print but available used. Medieval Underpants and Other Blunders: A Writer’s (& Editor’s) Guide to Keeping Historical Fiction Free of Common Anachronisms, Errors, & Myths, by Susanne Alleyn, Second Edition, Spyderwort Press, 2013, e-book. Merriam-Webster’s Collegiate Dictionary, 11th Edition, Merriam-Webster, 2003. Or any older edition. (The 2016 edition seems to have eliminated most of the dates.) 11th ed. gives dates of when words entered the English language. The only thing better is The Oxford English Dictionary, if you can afford it and have somewhere to store the multiple volumes. But that you can find at the library. 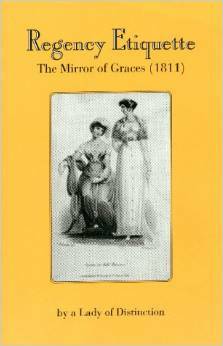 The Mirror of the Graces by A Lady of Distinction, first published in 1811. I have a paperback copy, but it’s available in e-book format format. North American Wildlife: An Illustrated Guide to 2,000 Plants and Animals, Reader’s Digest, 1982. Available in paperback. The Penguin Dictionary of Historical Slang by Eric Partridge, Penguin Book, 1972. Now out of print except for a ridiculously over-priced e-book version. Buy used. The Random House Dictionary of the English Language, Second Edition Unabridged, 1987. Out of print, but probably available at the local library. The Old West series, Time-Life, out of print but in libraries. The Victorian House Explained, Trevor York, Countryside Books, 2005. Part of the England’s Living History series which includes houses of various eras, the Industrial Revolution, steam railways, canals, etc. What Jane Austen Ate and Charles Dickens Knew: From Fox Hunting to Whist-The Facts of Daily Life in Nineteenth-Century England, Daniel Pool, Touchstone, 1994. Still available in paperback and Kindle editions. What Life Was Like… series, Time-Life. The Writer’s Digest Character Naming Source Book, Sherrilyn Kenyon, Writer’s Digest Books, 1994. Available used on Amazon.com. The Writer’s Guide to Everyday Life in the Middle Ages: The British Isles From 500-1500 by Sherilyn Kenyon, Writers Digest Books First Edition 1995; e-book 2014. In the 1990’s, Writer’s Digest published numerous titles on Everyday Life in various historical periods, all of which are now out of print but available as used books. I wish the other authors would make them available as e-books like Sherilyn Kenyon has done.